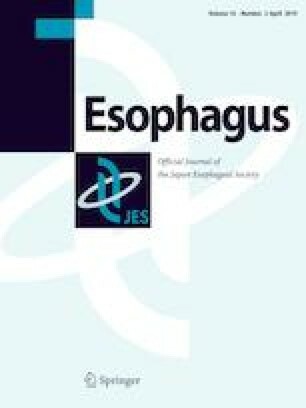 Previously, we identified that rs1229984 in ADH1B, rs671 in ALDH2, and smoking status were independently associated with the risk of developing metachronous squamous cell carcinoma (SCC) after endoscopic resection (ER) for esophageal SCC (ESCC). However, this analysis included cases with short-term follow-up. In the present study, we investigated the environmental and genetic factors associated with developing metachronous SCC using long-term follow-up observation after ER for ESCC. One hundred and thirty ESCC patients who underwent treatment with ER were followed up using endoscopy for ≥ 30 months. We investigated the incidence of, and genetic/environmental factors associated with, metachronous SCC development after ER for ESCC. We also analyzed the potential risk factors for multiple metachronous SCC development using Cox’s proportional hazards model. Moreover, we constructed a risk model for the development of metachronous SCC after ER for ESCC. Male, rs1229984, rs671, alcohol consumption (> 20 g/day), smoking, and multiple Lugol-voiding lesions (LVLs) significantly affected the incidence of multiple metachronous SCCs. Multiple Cox proportional analysis revealed that rs1229984, rs671, alcohol consumption, smoking, and multiple LVLs were independently associated with the risk of developing metachronous SCC. Patients who had ≤ 2 risk factors did not develop metachronous SCC, and the risk of developing metachronous SCC in patients with ≥ 3 risk factors was significantly higher than in patients with ≤ 2 risk factors. The risk model using these 5 genetic and environmental factors is useful as an indication for multiple metachronous development in ESCC patients. The online version of this article ( https://doi.org/10.1007/s10388-018-0643-7) contains supplementary material, which is available to authorized users. We would like to thank all the patients and members of the Hiroshima Liver Study Group in Japan, who donated their DNA for this study. We also thank Sakamiya and Izumoto, RIKEN, and the technical staff of the Laboratory for Genotyping Development, Center for Genomic Medicine, RIKEN for their technical support. The identity of the patients has been protected by linkable anonymizing. All study participants provided informed consent, and the study design was approved by the Hiroshima University Human Genome ethics review board.